I love Hallowe’en. The candy, the costumes, connecting with neighbours, the candy. But there is a darkness around this holiday and we can’t just pretend anymore. I know, I know, we can choose to focus on the fun and light-hearted side of All Hallows’ Eve, but some things cannot be ignored. PURE EVIL CANNOT GO UNCHECKED. Let’s shine a light on this sinister interloper who tries to spoil this holiday every year. For the sake of the children, we need to work together to take back Hallowe’en. For the children. It might seem harmless at first, perhaps even a nice substitute for some other elements of trick-or-treating, but I assure you, it is not. It’s a wolf in sheep’s clothing is what it is. Oh, here, let me wear pure evil on my finger. They are a great alternative to all that candy. No one is allergic to plastic jewellery. True, but not a selling feature. Parents appreciate having candy to steal after bedtime. Bear with me as I deep dive for a moment. This is holiday that’s main purpose is to promote binge-eating chocolate, chips, and candy. Why would anyone want to interfere with that? Besides, you have to walk door-to-door, burning so many calories that it all evens out (don’t worry, if you believe hard enough, that’s mostly true). You know what else is nut-free? Money, McDonald’s gift cards, all those candies that say “nut-free” on the package. It’s covered. A stash of candy will eventually disappear, but you know what never goes away? TINY PLASTIC RINGS. Children do not forget and they are miniature hoarders. They might forget the number of fun-size Twix bars they had, but they always remember how many spider, witch, and jack-o-lantern rings they own. Can’t eat those, Mom and Dad. You can’t eat those. 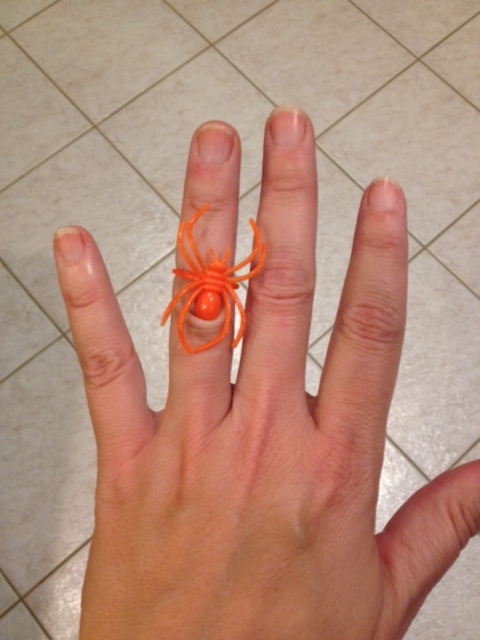 Some parents might appreciate candy-free options, but they also appreciate not stepping on small plastic rings in a darkened hallway. And here’s a fun fact: you cannot vacuum up a plastic ring, even if you run over it a several times. Even if you pick it up, turn it over, push the little spider legs down, then drop it back on the floor and try to vacuum it up again (I would imagine). So let’s leave Halloween as nature intended – high-fructose, fun-sized, and delicious. P.S. Fruit is also not a treat. Author Jan MoyerPosted on October 29, 2015 October 30, 2015 Categories Random BananasTags candy alternative, Halloween, humor, parenting, trick-or-treat1 Comment on No Candy? No Thanks.